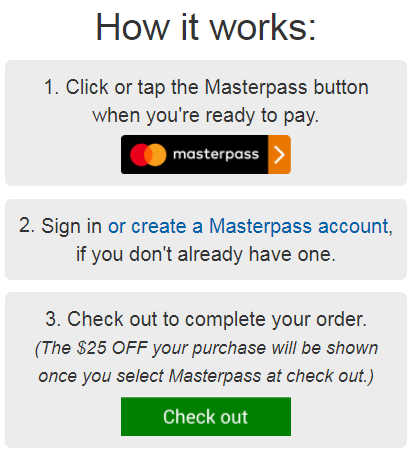 Normally, you should be able to link your AmEx credit card in Masterpass (just like Paypal). So, it means that you can buy things on costco.ca using your AmEx credit card. One of my friend told me that you can link AmEx card in Masterpass, but you still cannot use AmEx Masterpass on costco.ca.... Only MasterCard in Masterpass can be used for this promotion. Maximum of one (1) $25 OFF is available per member during the promotional period. Offer not valid for Costco ‭purchases made in warehouse, in Costco Business Centres, on costcobusinesscentre.ca, or on purchases of ‭Costco Cash Cards, travel, tires, membership, or membership renewals. Only Canadian Costco members in good standing may take advantage of this offer.